There are also 11 others, two of which are mirror images of each other. But how do we know this? How do we list them all and be sure we haven’t left any out? So: to get an Archimedean tiling you need n whole numbers whose reciprocals add up to one less than n/2. since it has 3 polygons meeting at each vertex: a 4-sided one, a 6-sided one and a 12-sided one. Hmm, now I think this one is my favorite, because my eye sees it as a bunch of linked 12-sided polygons, sort of like chain mail. 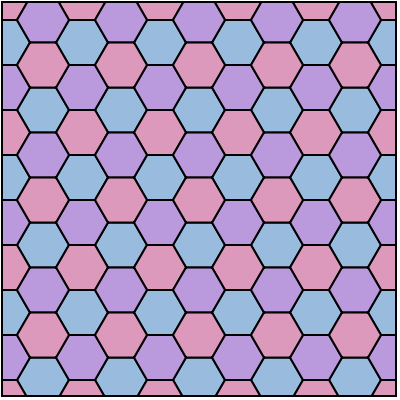 Different tilings make my eyes move over them in different ways, and this one has a very pleasant effect. This gives two Archimedean tilings that are mirror images of each other! They instead say it’s regular. 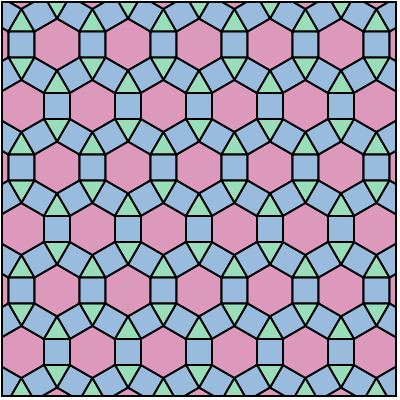 If modern mathematicians were inventing this subject, we’d say regular tilings are a special case of Archimedean tilings—but this math is all very old, and back then mathematicians treated special cases as not included in the general case. For example, the Greeks didn’t even consider the number 1 to be a number! since an equilateral triangle has the smallest interior angle, of any regular polygon, and you can only fit 6 of them around a vertex. If you think a bit, you’ll see this cuts the puzzle down to a finite search. It works beautifully at one vertex, but not for a tiling of the whole plane. To save the day he had to add some stars, and some of the decagons overlap! The Islamic tiling artists, and later Penrose, went further in this direction. • Michal Krížek, Jakub Šolc, and Alena Šolcová, Is there a crystal lattice possessing five-fold symmetry?, AMS Notices 59 (January 2012), 22-30. • Combinations of regular polygons that can meet at a vertex, Wikipedia. which happens to be related to a wonderful thing called Klein’s quartic curve. 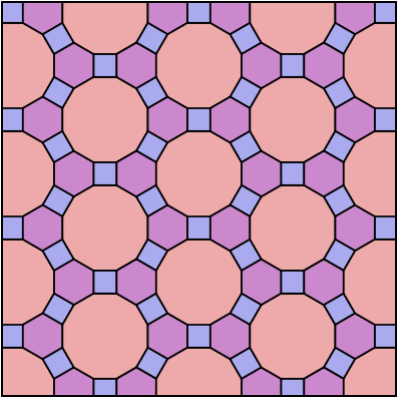 • Uniform tilings in hyperbolic plane, Wikipedia. • Don Hatch, Hyperbolic tesselations. These tilings of the sphere are technically called Archimedean solids and (if all the polygons are the same) Platonic solids. Of these, only the snub dodecahedron and the ‘snub cube’ are different from their mirror images. • John Baez, This Week’s Finds in Mathematical Physics (Week 182). This only gets into ‘Platonic’ or ‘regular’ tilings, not the more general ‘Archimedean’ or ‘semiregular’ ones I’m talking about today—so the arithmetic works a bit differently. • Julie Bergner, Groupoids and Egyptian fractions. • Ron Knott, Egyptian fractions. This entry was posted on Sunday, February 5th, 2012 at 1:43 am and is filed under mathematics, puzzles. You can follow any responses to this entry through the RSS 2.0 feed. You can leave a response, or trackback from your own site. Thanks for the colorful pix and even an animation. 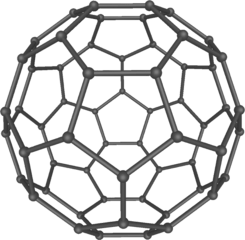 Along these lines, one of my current favorite Archimedean solids is the truncated icosidodecahedron, which looks sort of like your first favorite at the top of the article. It’s got a pleasing mix of shapes and sizes, and it’s the Cayley graph of the Coxeter group (which is in turn the full group of isometries of the icosahedron). 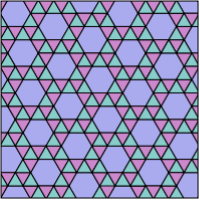 So, here’s a question for you, Todd: is this tiling also the Cayley graph of some group? Maybe a group coming from an affine Coxeter diagram? Yes, I think the name of a polytope should resemble its appearance, so if it has lots of faces of different shapes its name needs lots of shiny, sophisticated syllables. The modern standard name for the ‘great rhombitrihexagonal tiling’ is apparently the ‘truncated trihexagonal tiling’. Conway has his own names for all these, and for him it’s the ‘truncated hexadeltille’. I like the idea of extended Schläfli symbols, which seek to reduce this fancy nomenclature to a logical numerical code, but even these seem to stagger under the sheer diversity of interesting polytopes. Hmm, Wikipedia says these gave way to Coxeter diagrams. That suggests I could look up the answer to my question to you—but I won’t! My off-hand guess is yes, it’s the Cayley graph of the Coxeter group whose Coxeter matrix is 3 by 3 and whose off-diagonal entries are , , and . However, I’m drinking right now (it’s the Superbowl), and last time I drank and posted I said some things which were embarrassingly wrong. I should come back to this later, when I can look into this more closely. If that’s right, I feel like calling the result an ‘affine Coxeter diagram’, but I don’t think I’ve actually ever seen it. Hmm… oh yes, it’s called in this list on Wikipedia. They even discuss how these diagrams are related to ‘uniform tilings’ of the plane, which I’ve been calling Archimedean tilings. I think that you have a typo in the formula where you introduce Kepler’s attempted tiling (5, 5, 10). You’re right! I’ll fix it now. Thanks! I’m not a scientist, but I love new angles on things – gravity as an entropic by-product, amazing! Since hyperbolic space has an intrinsic length scale, if you make polygons very small, they begin to behave more like Euclidean ones. 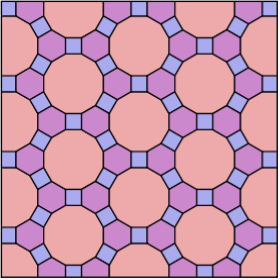 If you made the heptagons in the (7,3) tiling of the hyperbolic plane a little larger, they wouldn’t quite reach all the way around, and would begin to leave a gap rather like pentagons do in Euclidean space. 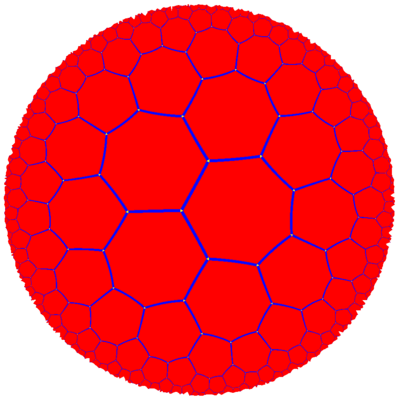 Is there a regular hyperbolic polyhedron whose sides are all heptagons? I have no idea what you mean by a “regular hyperbolic polyhedron”! If you hadn’t said more, I’d assume you meant a tiling of the hyperbolic plane by regular polygons—just as an ordinary regular polyhedron is a tiling of the 2-sphere by regular polygons. Spherical geometry and hyperbolic geometry are the two most symmetrical non-Euclidean 2d geometries. But, given the rest of what you said, I’d guess you’re thinking about a tiling of the “hyperbolic 2-sphere” by regular heptagons. The problem is, there’s no such thing as the “hyperbolic 2-sphere”: thanks to the Gauss–Bonnet theorem, there’s no way to give the 2-sphere a Riemannian metric with everywhere negative curvature. Take a n-holed torus, give it a Riemannian metric, and tile it with heptagons whose sides are geodesics and whose interior angles are the usual interior angles of a regular heptagon. Then n can’t be 0 or 1; it must be 2 or more. Again this is a spinoff of the Gauss–Bonnet theorem. Luckily, you can give the 3-holed torus a metric with constant negative curvature, and tile it by 24 heptagons whose sides geodesics and whose interior angles are the usual interior angles of a regular heptagon. This gadget is the closest thing I have to a good answer to your question. This is called ‘Klein’s quartic curve’ and I have a nice webpage on it. This in fact gives the most symmetrical Riemannian metric possible on a 3-holed torus! The symmetry group of the 3-holed torus with this metric has 336 elements. That number is 24 × 7 × 2. You’ve seen the numbers 24 and 7 in my discussion already; the factor of 2 comes from an orientation-reversing symmetry. (Coincidentally, 336 is the number of hours in a fortnight). The hyperbolic plane has a constant negative Gaussian curvature K. Define ; this is a length scale intrinsic to the space. A regular heptagon will have the sum of its exterior angles be greater than 360 degrees, but how much greater depends on the size of the heptagon. Only when the heptagon is the correct size will the exterior angle be 60 degrees so we can fit three of them together at a vertex to get the (7,3) tiling. If they’re large enough, the external angle becomes 90 degrees and we get the (7,4) tiling. Between these two sizes, seven heptagons around a central one leave a gap, rather like five pentagons around a central one. In Euclidean 3-space we can curl up pentagons into a dodecahedron; we can do the same in hyperbolic 3-space for pentagons of the correct size whose external angles are 90 degrees—in fact, these tile hyperbolic 3-space and one appears in the Mathematica logo. Since these “hyperbolic dodecahedra” exist, I was wondering if one can use the gap between heptagons in the hyperbolic plane whose size is somewhere between the ones in the (7,3) and (7,4) tiling of the plane to curl them up into a polyhedron with regular heptagons as sides. I guess I might as well start with hexagons rather than heptagons. 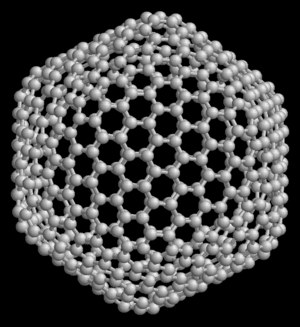 Is it possible to have a hyperbolic polyhedron with three hexagons meeting at a vertex? The hyperbolic dodecahedron has dihedral angles of 90 degrees and tiles hyperbolic 3-space; every vertex has three orthogonal lines passing through it, and there are planar slices that result in the (5,4) tiling of the hyperbolic plane. What prevents a similar construction involving hexagons and the (6,4) plane? I still don’t really understand what you’re saying, so I’ll just blather at random. where is the genus, or number of holes in our doughnut; here . It’s easiest for me to explain this in the case where we imagine subdividing a sphere into heptagons with meeting at each vertex. You can easily generalize what I’m about to say. since each vertex has 3 edges coming out of it, but each edge ends at 2 vertices. I get the impression you’re trying to violate such laws of topology. That’s a great proof, thank you! I noticed yesterday that we can easily tile a sphere with just two heptagons: take one to be the northern hemisphere, one to be the southern hemisphere, and divide the equator into 7 segments. But in this case we only have two heptagons meeting at each vertex: that’s a bit degenerate. 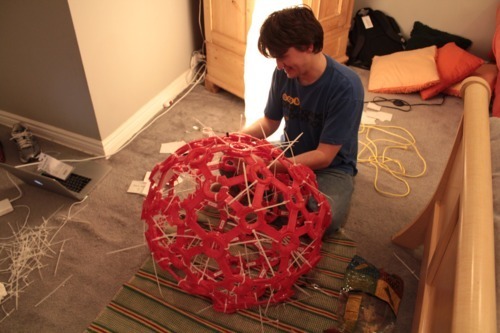 I read this blog quite often and have never had much to share but I think my friends post that I read moments before this fits this blog quite nicely…It may not be “Great”, but behold, the recycled rhombicosidodecahedron! Awesome! These past few weeks I’ve had a craving for a bunch of Magnetix, precisely to construct such a thing… but you can’t buy them in stores anymore because of a recall a few years back. as close to 1 as possible, while still less than 1, the very best you can do is It comes within of equalling 1, and this has amazing consequences. 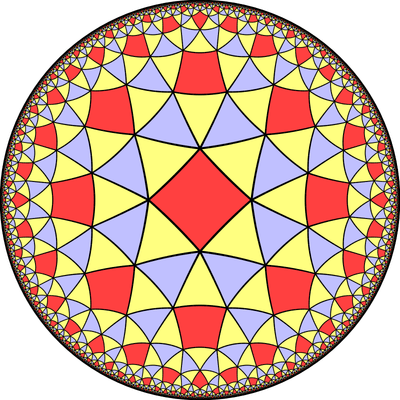 Archimedean hyperbolic tilings get much more interesting with 4 or more edges per vertex. 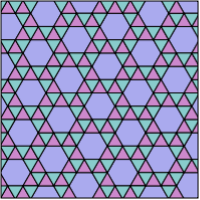 At this point, there is a possibility of having several different tilings which, nonetheless, have the same sequence of polygons around a vertex. For example, a tiling with three hexagons and one triangle around each vertex has three different forms. With more complex vertex configurations, there can be many distinct tilings. Is there a place I can see pictures of these? Lately, I tried using HyperbolicApplet (http://aleph0.clarku.edu/~djoyce/poincare/PoincareApplet.html), but it requires some image editing to get a proper colored picture.